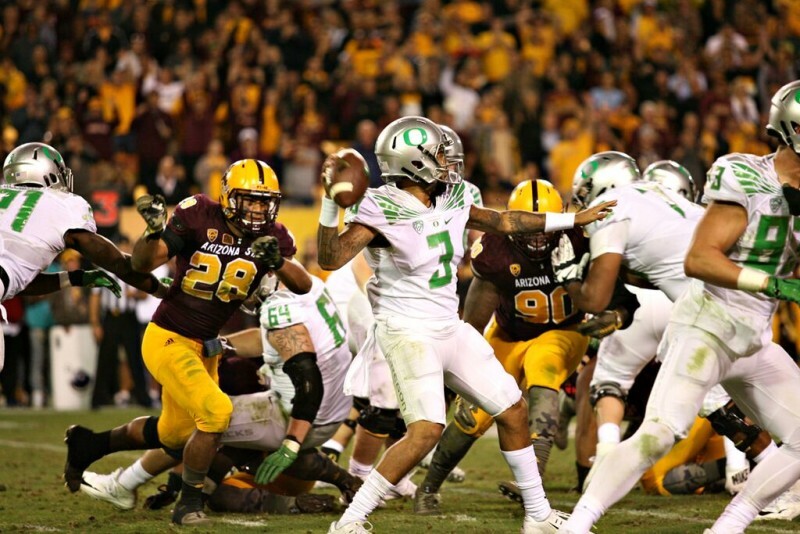 Vernon Adams was given an impossible task — be the quarterback who replaces Marcus Mariota. Media and fans tried to temper expectations, but it was clear from early on; no one said they expected Adams to be Mariota, but secretly they were evaluating his performance based on the same standards — winning the first Heisman Trophy in school history can have that effect. Elevating the expectation of what an Oregon quarterback is capable of achieving was once a near-impossible feat. Before Mariota, it was Joey Harrington who set the gold standard for Oregon signal-callers. Harrington’s shadow was large enough — he was Oregon’s only other Heisman finalist quarterback, and he was the last Oregon senior quarterback to start on Senior Day. Only three other quarterbacks have worn his iconic No. 3 jersey since his graduation – Chris Harper, Bryan Bennett and Jake Rodrigues – all of whom eventually transferred. The challenge Adams faced and continues to face, exceeds those of any Oregon quarterback prior, for two reasons: Not only did he have to immediately replace the Heisman Trophy winner, but he was also the first Oregon quarterback to be evaluated under “revised,” expectations. If he had won the Heisman Trophy, he only would have met the level of achievement set by his predecessor. Damned if he did and damned if he didn’t. It is easy to see why his early play received so much criticism: He wasn’t better than Marcus. 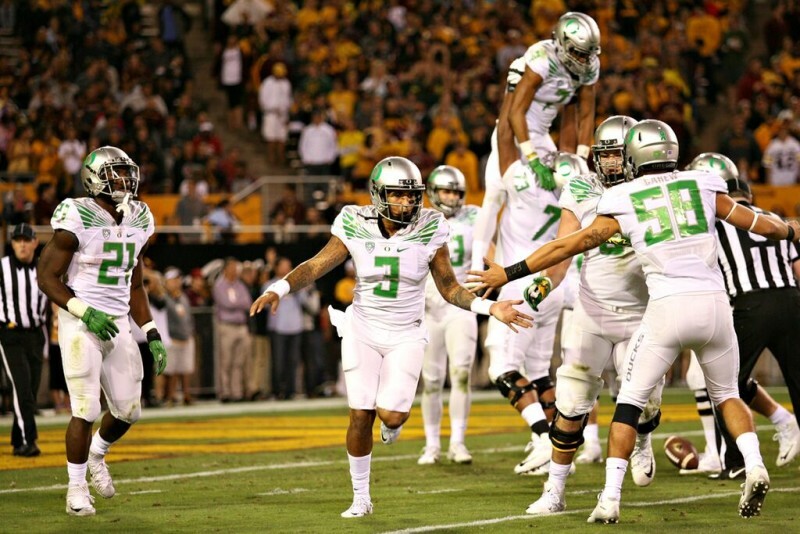 Vernon Adams and the Ducks celebrate a score in Thursday’s 61-55 win over Arizona State. But those standards evaporated after Adams’ fractured thumb left him sidelined for three-and-a-half games. Two losses and a grain of salt later, we remembered the competition as between a pair of backup quarterbacks. That perspective has given Adams the breathing room to thrive since his return. While he may never match the stellar explosion that was Marcus Mariota, no Pac-12 quarterback in nearly half a century has either, except for USC‘s. 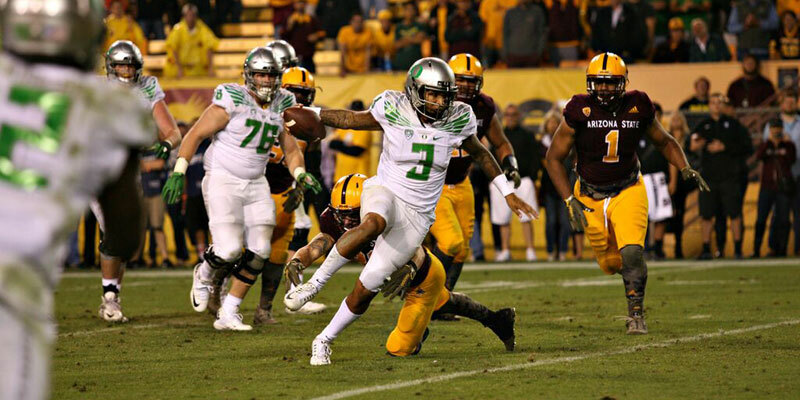 So for his inspiring play and miraculously captained comeback, we say, “Bravo,” to Vernon Adams, and offer him membership to the once-unattainable, now illustrious, and oh so funky fresh, Joey Harrington-level of excellence! Please collect your commemorative Blazer and festive tote from the gift counter. As a starter, Comeback was 13-2 in one-score games, meanwhile, the Ducks have played just 12 one-score games since 2010. Most Harrington wins were a spectacle, but none were as dramatic as the 56-55 slugfest over Arizona State in 2000. With less than four minutes left, the Ducks trailed, 49-35. Tick, tock. Fourth and goal, Ducks get stood up at the line with 1:22 remaining. The air turned a bitter shade of Sun Devil, and a red cold swept out from the Arizona desert. Flowers wilted in Eugene, and all its green little children cried. But Harrington summoned every ounce of his inner captain, and, at the end of two periods in the purgatory of overtime, came back, to walk away … a victor. As I mentioned in last week’s article, headed into Thursday’s matchup with Arizona State (that I said would be a wild, close game), every game Adams has finished against a Power 5 opponent has been a one-score game, and that still remains true after Thursday’s game. This year’s Ducks are a throwback to the near-vintage Oregon teams from the turn-of-the-millennium, when the Ducks made fans sweat every win and loved every minute of it — if they won, of course. Conditioned by years of blowout wins and close losses, Oregon fans now equate any close game with a likely outcome of certain doom. This year’s team is different, and while they may not be great, they are fun. That’s what makes Adams the perfect quarterback for this team, and what makes him the ideal replacement for Mariota — both quarterbacks reflected the image of their team. While Mariota was the lead surgeon of an offense that tactically dissected its opponents, Adams perfectly fits a team whose objective seems to do whatever it takes to grab a win. It may be dirty, it may be close, and it may be gritty, but the Ducks just won two straight games as road underdogs — something they haven’t done since 2005-2006. Next up is Saturday’s game against the Cal Bears. Dueling quarterbacks and overpowering offenses will be the things to watch for; the first team with a pick-six could take the game. If the Ducks edge out a close one, it will give Adams something Mariota never had — three one-score wins as an Oregon quarterback.